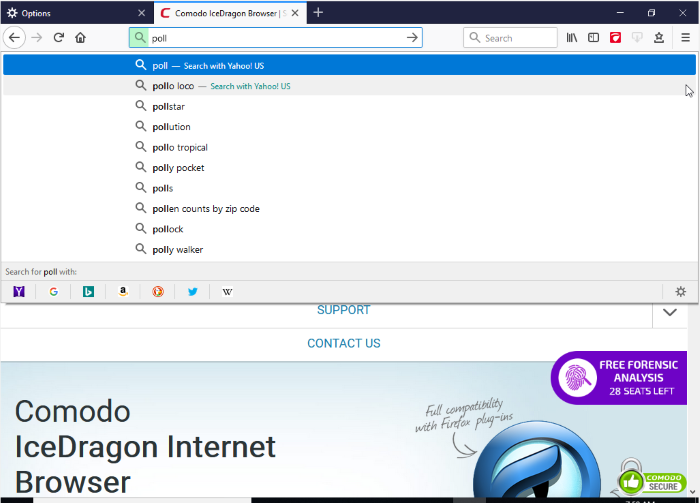 Ice Dragon uses your browsing history and bookmarks to provide suggestions when you start typing an address in the address bar. Simply click on one of the suggestions to visit that page. IceDragon allows you the select the sources from which the suggestions are drawn, or to stop suggestions altogether. Browsing History - Provides suggested sites from your browsing history only. Bookmarks - Provides suggested sites from your bookmarked sites only. Open tabs – Provides suggested sites from open tabs only. Allows you configure IceDragon to block suggestions from a specific website. Click the hamburger/ menu button at the top-right corner and select 'Library' > 'History'. Click 'Show All History' at the bottom of the menu. In the 'Library' interface use the 'Search History' at top-right to find a web site. Right-click on a website page and select 'Forget About This Site' from the context sensitive menu. Ice Dragon will no longer suggest pages from the website. Hover your mouse cursor over the suggestion you want to exclude and press 'Delete' key from the keyboard.